No, I'm not shilling for Gino's Pizzeria or advising you go back in time to see Richard III at Cinemapolis. 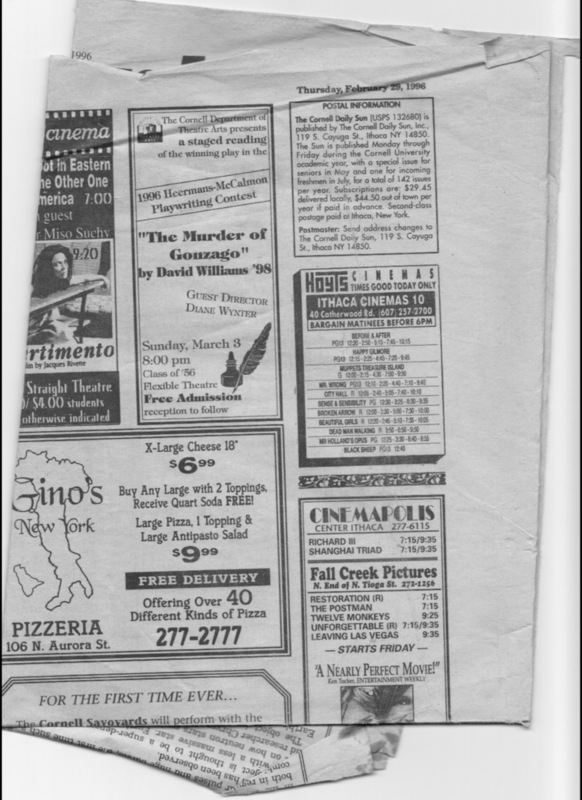 Up top is the ad for the first award I won, first place in Cornell University's Heerman-McCalmon Playwriting Contest. Now, contests and awards should never be the reason anybody pursues an artistic endeavor, and who can judge between two pieces of art or literature and determine which one is more worthy of accolades? But ... once in a while it's nice to get recognition. It's great to submit a script to a theatre company that knows nothing about you, have them read it, and then get the call or email that says that they like your script enough to take it one step further (be it a staged reading, inclusion in a festival, or a full-on production). I submitted three scripts to the Heermans-McCalmon playwriting contest that year, and I won first and second, meaning "The Murder of Gonzago" received a stage reading directed by Diane Wynter. It was my first time seeing real, non-college actors perform my plays, and also my first time having someone else direct my work. Having a playwriting contest right at my school (one with impressive prizes for first and second) and a terrific playwriting track run by Ron Wilson was a real gift for an aspiring playwright. I had written four one-act plays by the time I submitted to that contest, never thinking anything would come of it. Winning that year was a real boost for me and helped set me on this writing path.